Powdered nutrition is the newest trend and is worthy of all the praise it is garnering. It is easy to add to any meal, nutrition dense, less processed compared to pills and are easy for the stomach to absorb. 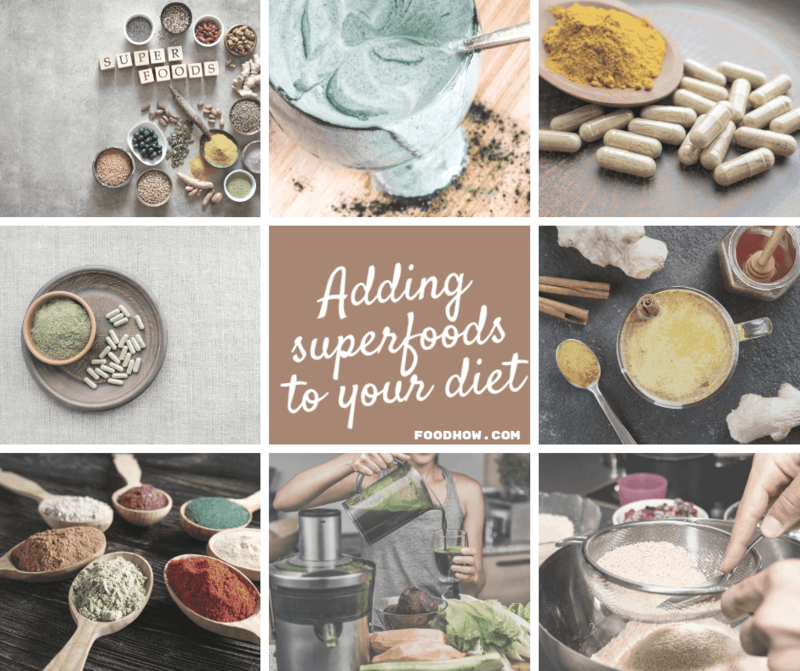 You may have tried some common superfoods in powdered form such as spirulina powder, cinnamon powder and maca powder, but there are many others that you may not be aware of. So, here is a list of top seven superfoods that you get in powdered form. Turmeric belongs to the ginger family and is found extensively in India and Southern Asia. Turmeric powder is made from the plant’s rhizome, which has brown skin and a bright orange flesh. It has a fragrant aroma and is commonly used in Indian cuisine. It is well known for its medicinal benefits and traditional medicinal systems have long used it for preventing and treating a wide variety of health problems. Spirulina, a type of blue-green algae, truly packs a punch when it comes to health and wellness benefits! Just some of the beneficial nutrients spirulina contains include B vitamins, beta-carotene, vitamin E, chlorophyll, phycocyanobilin, and many other micro-nutrients and antioxidants. 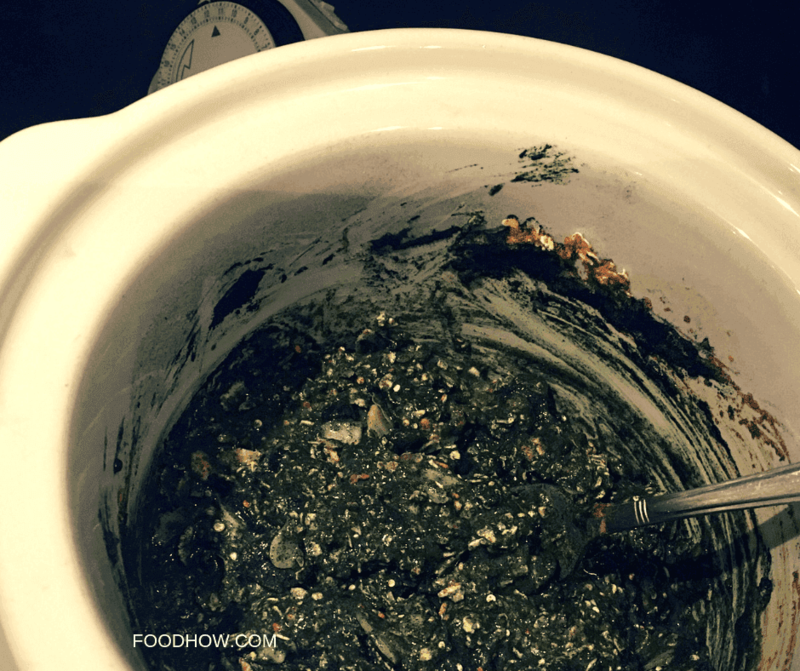 In addition, spirulina is relatively high in protein – which means that depending on the formulation (check the label), there is a chance to re-discover your spirulina powder jar as an exciting source of vegan protein. Helping maintain healthy cholesterol levels. One study found that after 4 months of consuming spirulina, participants experienced significant reductions in cholesterol compared to the placebo group. Easing the symptoms of allergic rhinitis. Whilst the exact mechanisms remain a mystery, it has been scientifically proven that spirulina facilitates in normalising nasal discharge, reducing congestion and sneezing, and calming down itching. As a result, many individuals consume spirulina powder throughout the hay fever season – and with great success! Maintaining healthy blood pressure. Although not a universal benefit, in some people spirulina has been shown to keep blood pressure at bay – so it’s worth trying. According to preliminary research, spirulina can also offer a certain degree of protection against oral cancer, e.g. in tobacco consumers. Specifically, spirulina aids in healing precancerous oral lesions even in individuals who keep consuming tobacco even upon receiving a warning – however, it’s not a good enough excuse to keep smoking! And finally, spirulina powder adds unique pleasant taste when blended into smoothies – yum! Pollen is the male seed of the flowers and renders the characteristic yellow colour to bees. This golden powder reaches bee’s basket and turns into bee pollen. Bee pollen is believed to contain almost all the nutrients our body needs to function properly. Honey powder is the dehydrated form of natural honey. Normally, it contains less than 2 percent of the typical liquid content of the liquid form of honey. Honey powder has a much longer shelf life and is easier to use. Honey powder has antiseptic, antibacterial and anti-inflammatory properties. It contains large amounts of Vitamin B and C. It is also rich in minerals such as iron, calcium, potassium, magnesium, selenium and phosphorus. These powdered superfoods, when added to your daily diet can make a huge impact on your overall health and well being. However, make sure that you buy only the best quality powders to get the most nutrition and health benefits. This is my later addition to this list as lately this nutrient-rich seaweed has been receiving increased attention, thanks to the amazing health benefits the superfood has to offer. Whereas the benefits of ginger, spirulina and other powders above are relatively widely-known, chlorella remains a new kid on the block. So, after I started using it with such a noticeable and positive effect I decided to add it to the list. The other reason I wanted to mention this powders is that to my knowledge, this is the only food powder that is effective against mercury overload in the body. So if you are eating a lot of fish or have many silver fillings then chlorella is the best choice for helping to get rid of some of the mercury in your body. Just some of the nutrients chlorella is bursting with include vitamin B12, iron, vitamin C, omega-3s, and plenty of other vitamins and minerals. In addition, like many other types of algae, chlorella contains up to 60% protein which is also complete, meaning it has all nine essential amino acids! However, before relying on chlorella powder as a protein source, check the packaging and dosage instructions, as you may not end up consuming enough powder to ingest any significant amount of protein due to small portions needed to yield other benefits. Many studies indicate that chlorella can help remove heavy metals and other toxins from the body. Specifically, it can bound to these harmful compounds, making it easier for the body to extract them. In many scientific investigations, chlorella has shown the ability to enhance the immune response in both animal and human subjects – however, the effects haven’t been consistent in all populations. It appears that immune-boosting properties of chlorella work best in people under 55, but not as much for older individuals. However, there are plenty of other benefits making chlorella powder useful for all adults! Due to high antioxidant content, chlorella supplements may help lower “bad” cholesterol levels by preventing the oxidation of LDL cholesterol, a powerful culprit in cardiovascular disease development. In addition to normalising cholesterol levels, antioxidants can help fight many other chronic conditions, as well as slow down gene ageing. Preliminary evidence shows that chlorella supplements may assist in improving blood sugar levels and increase insulin sensitivity – great news for diabetes sufferers! It’s best to combine chlorella powder with doctor-prescribed treatments, however. And finally, great news for athletes: chlorella powder has been shown to boost aerobic endurance, specifically via improved ability to saturate lungs with oxygen! This could be a welcome effect of chlorella’s high branched-chain amino acid content. There are many ways you can incorporate Superfood Powders in your everyday diet. One of the easiest ways to increase superfood powders’ consumption is adding them to smoothies. This also helps alleviate the unpleasant taste of certain powders (looking at you, spirulina) whilst still reaping the benefits. Avoid loading your smoothies with unhealthy ingredients such as canned fruit or sugary yoghurt. Natural and fresh is the key! Instead of mixing them with just water, another great option is adding superfood powders in juices. For instance, you may want to add some powder straight after juicing so the flavours blend in together. Alternatively, you can use store-bought juice, so long as it’s 100% natural and doesn’t contain added sugars. If you’re into baking, you can also add some superfood powder into the dough for a sneaky boost of goodness! It’s worth noting that these powders are simply concentrated versions of certain foods, and not meal replacements. Superfood powders can be so much more convenient than raw superfood counterparts! They are a great palatable way to add your favourite superfoods in about any dish, from juices, smoothies, salads, soups, scrambled eggs to ice cream and cake mix. One of my all-time favourites is turmeric latte. Yum. There are many benefits to superfoods: they are packed with antioxidants and micro-nutrients to give you an extra boost of wellness. Whatever the season is, adding these nutritious powders to your diet can make all the difference. Here is a simple yet delicious and healthy example of how to add some of these nutritious food powders to your everyday diet. So, here is how I make my morning porridge, however, you can modify the recipe for your own needs and liking. Smash the banana with a fork and mix the porridge oats with all the ingredients together in a small ceramic slow cooker bowl. If you cook for more then 1 person you have to choose a larger slow cooker. Chlorella and spirulina powders give the porridge a distinct green colour. Cooking Time: I have found that the best cooking time is between 4-6 hours. Anything below 4 and it will turn out bit raw/under-cooked. It is still edible but not that nice and anything over 6 hours and it is likely to burn. So, what I do, I use wall plug timer and I set it for 5 hours before I wake up in the morning and will be greeted by warm and nutritious bowl of oatmeal that has a really nice smell of cinnamon. IMPORTANT: Make sure you set your slow cooker to LOW. I did a mistake once and I set it to HIGH my mistake and the bowl was so burnt in the morning that I had throwing it away after a two days of soaking. 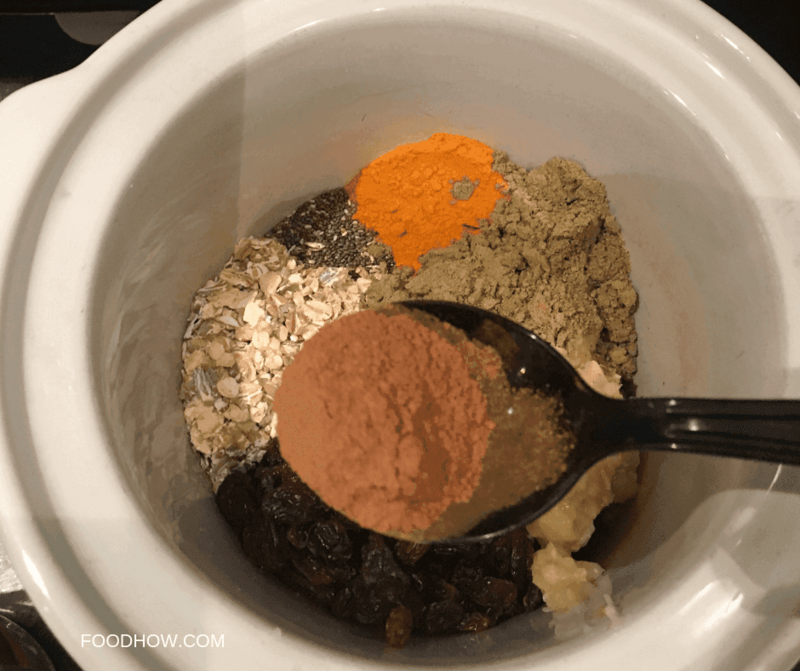 Also: I don't use any sweeteners in my porridge as the dried fruits makes it sweet enough for me but if you find that you might like it a bit more sweet or you want to mask the turmeric and/or ginger powder a bit then I would suggest that you use honey or honey powder instead of sugar to sweeten it. As I said, you can add or leave out some ingredients if you like. My friend doesn't like coconut so she leaves it out but she adds pieces of apple and bit of quinoa to her porridge. My daughter, for instance, she doesn't eat dairy so she makes it with water, but it won't taste as nice with water in my opinion. Possibilities are endless. 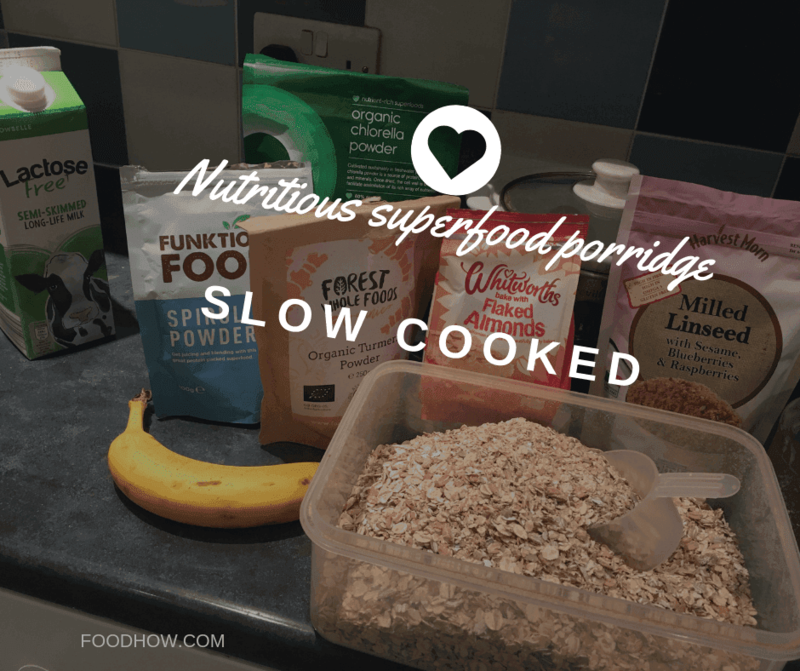 Once you have mastered this slow cooker porridge recipe you don't really want to eat regular porridge again. If you can't be bothered to make porridge every day or you don't have a blender to make shakes or smoothies then here is another easy and super convenient way of adding these healthy powders to your diet. 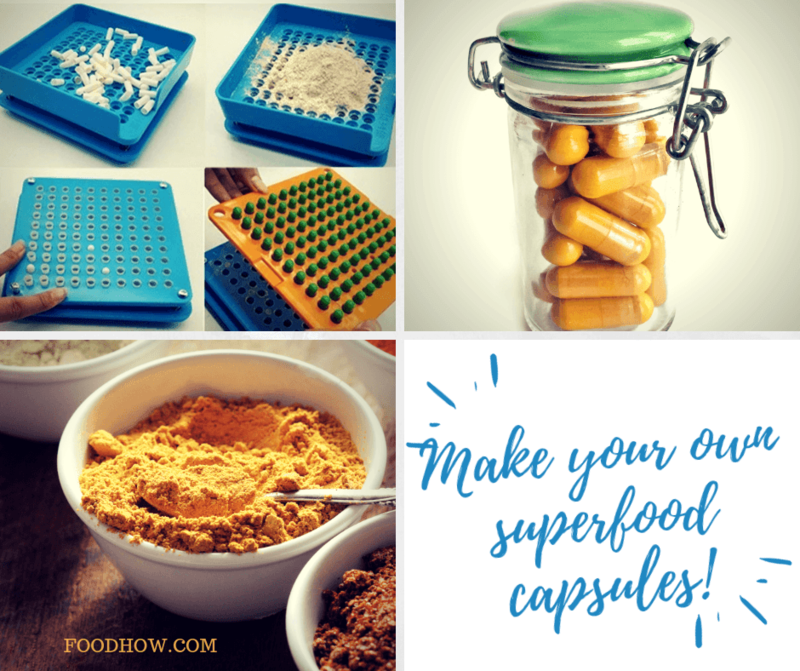 You can make your own superfood capsules! An easy and convenient way to get these amazing nutrients throughout the day. Having your favourite herbs and powders in capsules is not only very convenient but it also lets you control the quality and the freshness of the ingredients you want to use instead of relying on what manufacturers are adding into the capsules. Making your own supplement capsules is also a lot cheaper than buying ready-made ones. Thanks, Jen, I love the suggestions, I started going to the gum now and I also want to get my diet under control, I didn’t realize that I can get all these food as powders, that makes life so much easier. I already ordered Beetroot and the turmeric powder. I will put these in my morning power smoothie and in my protein shake and I love the idea you had in this article: https://foodhow.com/how-to-make-your-own-supplements/ I will make some capsules also so I can easily take my healthy stuff at lunch when I am at work. I didn’t know that bee pollen powder was a powder that I could purchase. I’ll be purchasing that off Amazon soon to try it out. Great article! Super useful post combined with your DIY supplement post! I may have to try out beetroot and ginger powders for myself, and if they do well for me, look into doing the DIY supplements with them. Anything anti-inflammatory is something that has my attention. Excellent and detailed article. That was very helpful. Will certainly try to add these super-foods to my daily diet. Thank you so much for sharing. I didn’t know that bee pollen improved fertility! Hmmmm. I am DEFINITELY gonna have to do more research on that. I’m looking at trying for a baby in the next couple of years, and I’ve had some reproductive trouble in the past, so that might be helpful. Thanks so much for the heads’ up!